The title track from the album 'Darklands' by The Jesus and Mary Chain, 1987. Still one of my favourite summer albums, despite the fact that all of the lyrics are about rain. The Essential Michael Haneke is a ten-disc DVD box set featuring all of Michael Haneke's films from 1989-2007 (including his adaptation of Das Schloβ by Kafka which was originally filmed for television but was then released cinemtically against Haneke's wishes). As with most Artificial Eye releases, the set is immaculately designed and presented, and features excellent interviews with the director about most of the films. Unfortunately, the box set was not released in time to incorporate Das weiße Band, my favourite film from last year. 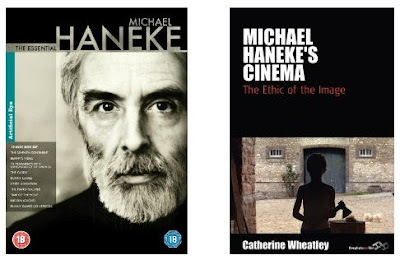 Catherine Wheatley's The Ethic of the Image considers Haneke's work in light of the traditions of counter-cinema and the idea of cinematic 'un-pleasure', and also in the context of Kantian ethics.